drop trade barriers and crown him as dealmaker-in-chief, or they will pay down government debt while saving favoured industries. “Plants are opening all over the US, Steelworkers are working again, and big dollars are flowing into our Treasury,” he tweeted on August 4th. How do those claims stack up? Tariffs are taxes on imports and so will bring some cash to treasury coffers. But comparatively little. In 2017 America’s government borrowed around 3.5% of GDP. Had the new tariffs been in place, and under the (extreme) assumption that the same goods had been imported despite costing more, they would have raised only 0.08% of GDP. Even including all Chinese imports, the number would have risen to just 0.7% of GDP. And that is before considering tariffs’ depressive effects on demand for imports and on economic growth. There is more substance to the claim that they have brought American furnaces and smelters roaring back to life. The volume of steel imports from the countries hit by tariffs and quotas was 36% lower in June than a year previously. The corresponding fall for aluminium imports was 27% (see chart). As prices have risen, so has production. Steelmakers are using 78% of their capacity, not far off the administration’s goal of 80%. And some idled aluminium capacity is being brought back online. But production data are volatile, and recent changes are relatively small when taken in historical context. And some of the recent activity would have happened without new trade barriers. Metal prices have been pulled higher by a strong economy. Higher aluminium prices are in part the result of more expensive alumina, one of the main inputs. American sanctions on Rusal, a massive Russian supplier of alumina, and cuts to alumina production in Brazil because of environmental problems, have left aluminium makers feeling insecure about supply. Those higher prices are a burden for businesses that use metals, which account for a far higher share of American jobs. They are doubly disadvantaged as inputs become pricier and overseas competitors can undercut them. Some have requested exemptions from the tariffs, only to be blocked by official objections from some of the biggest American steelmakers, which claim that they can supply the supposedly scarce products. But tariffs were not intended to help metal consumers, after all. In the first quarter of 2018, 52% of American steel exports went to Canada. Those are now being hit with retaliatory tariffs. On August 6th Alcoa, a large aluminium producer, requested a tariff exemption of its own so that it could import aluminium from its Canadian subsidiary to America. It had previously reported that tariffs had raised its costs by around $15m in the second quarter of 2018 (less than the extra profits from higher aluminium prices). Some producers within both industries do not smelt metal from scratch but recycle or process it instead. It is in their interests for their inputs to be cheap. So far aluminium processors (which account for 97% of employment in the industry) seem to have passed the extra costs on to their buyers. But in the long run higher prices could encourage a switch to different materials. Aluminium competes with steel for use in cars, and with glass in drinks containers. The big question is whether any revival can be sustained. In the short term, tariffs are more likely to bring older, relatively inefficient steel plants back online than to stimulate new long-term investments, for the simple reason that the president could withdraw the tariffs at any moment. The newest aluminium smelter in America is around 40 years old. If primary aluminium production revives sustainably, it will be because American producers can access cheap, reliable energy. 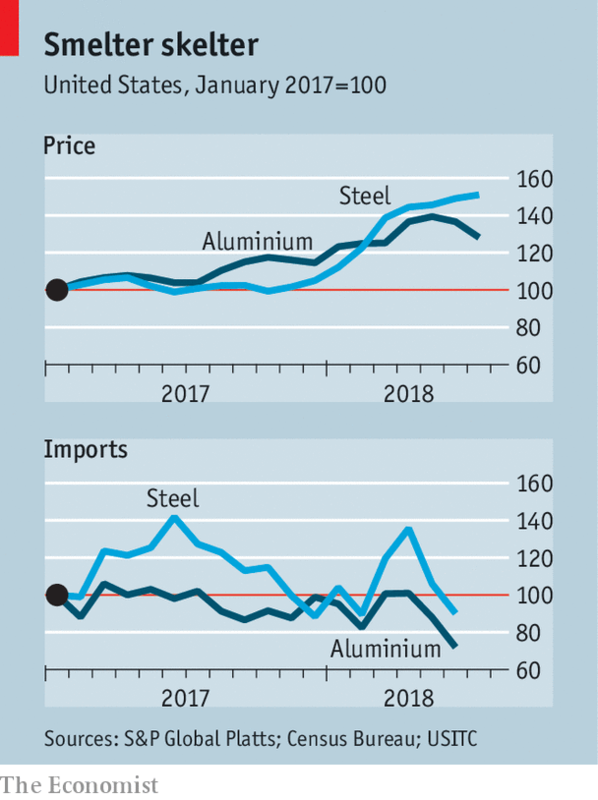 And tariffs do nothing to address the underlying complaint of American steel and aluminium producers: that state support gives Chinese producers an unfair advantage that has them pumping out production as job losses mount elsewhere. Populist policies can often deliver short-term results. The question for Mr Trump is whether his are worth the cost, and how long the benefits can last. This article appeared in theFinance and economicssection of the print edition under the headline"Metal clashing"